When it comes to health care, Seguros Costa Blanca is on a mission to bring reasonably priced private services to the English-speaking expat communities throughout the Murcia region and province of Alicante. Providing a flexible service, Eduardo at Seguros Costa Blanca is not restricted by office hours or even an office, preferring to talk to clients face to face in their homes rather than expect them to do the travelling. Seguros Costa Blanca understands that the public health services are working under different pressures and do not always provide the ideal level of health care. For those looking for quick and effective medical assistance, who do not want to experience lengthy waiting lists for specialist services, and who find other insurance providers to be too expensive, Seguros Costa Blanca has an answer. Through DKV, you can access top doctors and hospitals when you need them and above all, receive your health care in your native language. Segura Costa Blanca are representative and agent for the Spanish subsidiary of DKV insurance. DKV is a global player in the health insurance industry. Based in Luxembourg, this international company is currently operating in the majority of European countries. DKV’s mission statement is, “Second to none medical attention, anywhere and anytime -- with no disparity for location, age and nationality.” Eduardo at Segura Costa Blanca is the local agent seeking to bringing that global level of service to the Murcia and Alicante areas. Totally mobile, Eduardo from Segura Costa Balnca does not use an office when seeing clients. He prefers to travel to them, talking them through the various DKV options in the comfort of their own homes. Segura Costa Blanca understands that foreign residents and long term visitors to the region want quick and effective health care, available when they need it, and that they often do not want to ‘join the queue’ for the public health services. 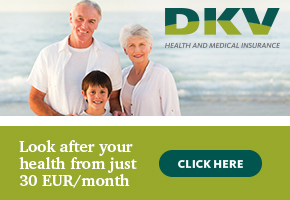 Thanks to Seguros Costa Blanca, DKV offers local expats blanket coverage options for private medical treatment using the latest and most modern facilities, with easy access to specialist consultants when necessary, and all for a competitive price. Seguros Costa Blanca’s goal is to bring DKV’s comprehensive services to the English-speaking communities of the Costa Cálida and Costa Blanca.